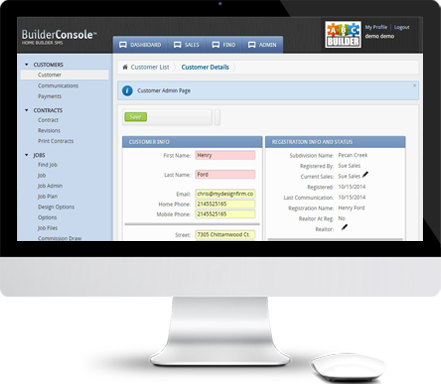 BuilderConsole is an advanced CRM / Sales Management Software framework for home builders. This framework provides the interface to your sales process, is a 100% customized solution and yours to own. Pros: BuilderConsole is an easy to use failsafe system that allows users at multiple learning levels to simply navigate and input data to produce a quality product. I love how they were able to customize the system to our internal operating system and meet expectations for our daily needs. Everyone who logged into the system complimented on how effortless it was to produce an actual contract. Cons: We were constantly wanting to change or add on to the system, which is easy to do, but with us always wanting more and more of the good stuff from the console, it could add up in $. Overall: BuilderConsole took us from filling in contracts by hand, to a professional grade contract. Our customers appreciated us for it. It made the Change Orders for our Construction Superintendents and Project Managers less confusing and more consistent throughout the company, and upper management and purchasing were better able to forecast final figures with less error than when sales people were hand calculating everything themselves.